Grace Williams is a composer whose works people might be able to name (Penillion, Fantasy on Welsh Nursery Themes, Ave Maris Stella) but whose wider repertoire remains relatively unknown. 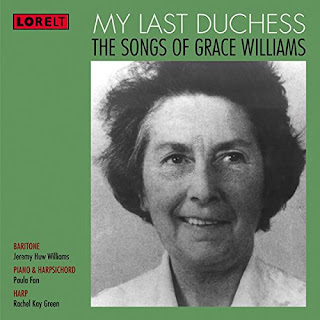 On this enterprising disc on Lorelt from Jeremy Huw Williams (baritone), Paula Fan (piano/harpsichord) and Rachel Kay Green (harp) we have a wide selection of Williams' songs from 1930 to 1974. Born in Barry, South Wales, Williams studied at Cardiff University and at the Royal College of Music with RVW, where fellow students included Elizabeth Maconchy, Dorothy Gow and Imogen Holst. As a result of a scholarship, she also studied in Vienna with Egon Wellesz. She wrote a significant amount of symphonic and choral music, and during the 1940s and 1950s wrote film scores and incidental music. So the present recital gives us a chance to explore a further aspect to Williams' music, her songs. We begin at the end, with a setting of Browning's My Last Duchess which was written in 1974, just three years before her death. It is hardly a song, more of a large scale scene and it comes as no surprise to find that Williams had earlier been contemplating an opera on the subject. There is an austere directness to the style of the piece, with an accompaniment which has a highly-wrought contrapuntal feel. There is almost a neo-classical feel to it, yet with an edge to the harmony. It is a slow-build piece, only gradually does the horror reveal itself, and both Jeremy Huw Williams and Paula Fan do it justice, though I could also imagine a more overtly operatic performance and Williams' diction is not always as clear is it could be. The distance that Williams' art traversed can be heard in the two early English songs on the disc, Tarantella (1930) and Thou art the one truth (1935) which are firmly in the orbit of her teacher RVW. Whilst The Red Sun Rises is a fragment from her incidental music of the 1940s and 1950s. We can see a clear path from the RVW pupil to something which incorporated Welsh folk influence with a far more mid-20th-century sensibility. This is most striking in Four Medieval Welsh Poems (1965) as Williams combines medieval texts with music written for the striking combination of voice, harp and harpsichord. The textures here are so strong you can almost touch them, this is a very long way from the comfortably folkloric, yet Williams' striking music also mines the Welsh tradition of penillion, improvisation over a harp accompaniment, which is central to Welsh musical experience. You wonder why the songs are not better known, and then consider that they set Welsh, a language which does not yet seem to quite make the international song recital stage. The Two 9th Century Welsh Poems of 1964 are something of a pendant to the previous work, as they were commissioned by harpist Ossian Ellis (who premiered the Four Medieval Welsh Poems) to sing to his own accompaniment. To striking effect, even when performed by two performers as here. The remaining songs on the disc are all folk related some with piano and some with harp, but Williams has the gift of making imaginative and interesting versions of the songs which neither trivialise nor over complicate. For all the generous acoustic in which the recording seems to have been made, the recording captures Jeremy Huw Williams' voice rather closely so that his vibrato is in danger of moving from the expressive to the intrusive, and occasionally introduces a hint of instability to the vocal line. But he sings with wonderful elan and commitment, and this is a valuable disc enabling us to experience the variety of Grace Williams' songs.